October 23, 2011 - The Air Transport Association of America (ATA), the industry trade organization for the leading U.S. airlines, commended the Federal Aviation Administration (FAA) for implementing the next phase of the U.S. Northeast airspace redesign project, which will bring immediate benefits to airline passengers. Most of the changes were made to the airspace over the busy New York airports, enabling flights to operate more efficiently in and out of the city?s airports, reducing delays for passengers. The FAA's Eastern Region Air Traffic Division has redesigned the airspace in the New York/New Jersey/Philadelphia Metropolitan area to reduce delays in the area. The major airports experiencing severe delays are: Newark International (EWR), John F. Kennedy International (JFK), LaGuardia (LGA), Philadelphia International Airport (PHL). The closeness of the airports results in complex interaction between Flight Crew and Air Traffic Controllers coordination and circuitous flight paths. The current airspace environment was inefficient for aviation users and FAA. From January-May 2011, EWR, LGA, JFK, PHL, and TEB equaled 12% of total National Airspace System (NAS) operations, 46% of total NAS delays. The FAA designed and implemented the New York/New Jersey/Philadelphia metropolitan air traffic environment in the 1960s. The volume of air traffic and the types of aircraft that use the airports have changed significantly. So has the Air Traffic Control system. It has grown beyond its procedural and operational capacity. As a result the area services over 8000 flights a day and 4 of the local airports are on the list of the 10 most delayed airports in the United States. ?The industry has long supported the redesign of the most congested airspace in the U.S. These changes will lead to immediate safety and efficiency benefits for airlines and passengers, and are a key component of the larger NextGen air traffic management project,? said Tom Hendricks, ATA?s senior vice president of safety, operations and security. ?These changes were possible thanks to FAA?s strong collaboration with the industry and labor. While further work remains to be done, this template is the best way to bring needed changes throughout the National Airspace System.? 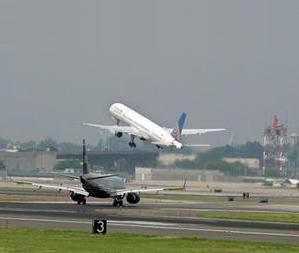 For more than a decade, the industry has urged the FAA to move forward with changes to the New York, New Jersey and Philadelphia airspace as the airports in that sector suffer from some of the worst delays in the country. Nearly half of all national airspace delays occur in the New York and Philadelphia airspace. This same congested airspace can have a ripple effect of delays to other parts of the United States, especially during weather disruptions. The second stage of airspace changes implemented today will enable airlines additional flexibility in terms of routings when they arrive or depart the New York metro area. The changes will also lead to improvements as far south as the Washington metro area. Some examples of the changes made today include the following: Aircraft leaving New York City airports heading west now have the option to use fifth departure route. This route will allow planes to climb more efficiently to higher and less-congested cruising altitudes. FAA also implemented new routings for flights arriving at Washington Dulles airport. The change in routings will separate traffic going to Washington from flights departing New York, reducing congestion in the region.